If set to true, only one language icon will be displayed and a click will advance to the next available language. Advantage: In the “navigation bar”, i. The block with the social and language icons will save space. This may make sense if you also want to support low-width screens and many social icons and languages. If this parameter is set to “false” (default setting), all language abbreviations or language icons are displayed in the navigation bar and the desired language can be selected specifically. This parameter can generally be used to reduce the height of all icons. This button can (additionally) be used to adjust (reduce) the height of the social buttons. The height of the selected (active) language can be set with this factor; regardless of the social buttons. The height of the other (non-active) language abbreviations or language icons can be selected independently of the other icons. This can be used e.g. when using the same icons for the active and inactive variant, which is the currently selected language. In such a case, one will choose the factor for the inactive language smaller than the factor for the active language. The valid value range is specified for each parameter. The default value is also displayed. *The effect of the JS specific parameters cannot be assessed in the preview window in mz3Tool *, because the preview is based on the AIR version of Megazine. All about 300 parameters are available in the AIR / FLASH variants. “1” indicates all the parameters that are frequently used. A 2-parameter is already used less frequently, and a 4-or 5-parameter should only be changed with the appropriate knowledge and needs. These notes are valid for all variants since the operation and the windows are identical. Depending on the variant, however, only the parameters are offered, which are each supported. If one parameter is supported in all versions, the corresponding parameters in the other versions will also be changed/synchronized. The window with the display of the specific book parameters is displayed via the Book Parameter button in the respective Settings menu. Each parameter is assigned to a parameter group. Similar parameters or logically related parameters are summarized in a group. Parameters can also belong to different groups. Filter for example. 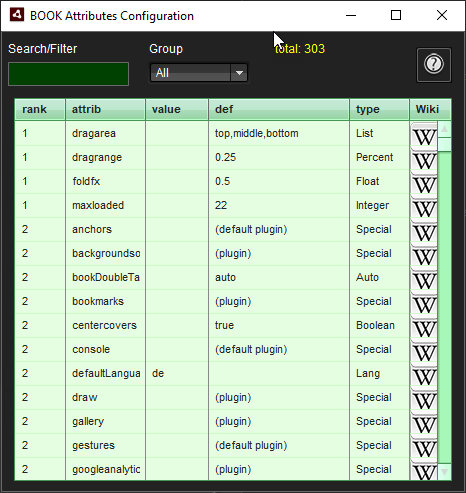 all parameters belonging to the group “drag” are displayed only 12 parameters out of 303 parameters. All columns can be sorted into the header with one click. Another click reverses the sort order. The default is “Sort by rank” to show the most important, most used parameters first. The following information (column headers) are displayed in the columns of the list. After opening, the list is sorted by “rank” (priority, “utility”). A value of “1” indicates the most commonly used parameters. The name of the parameter/attribute can be found in this column, which can be sorted into the header/identifier of the column in the same way as for all other columns. The set value is displayed in the “value” column. If the field is empty, the default settings are used. These are displayed in the next column “def”. Each value is defined and described in the wiki (but only in English). In the last column, you can find the link to the wiki entry for this parameter. This example also shows selected book parameters of the Air / Flash variant. With the JS variant, only the number of available parameters changes. If you select an attribute (parameter) in the list with a click in the row/cell, a new window opens. In this window, only attributes of the same group are displayed, as here the group “drag” (drag with the mouse). The current value of the selected attribute is displayed and can be changed via the specific and type-dependent “Editor” (setting help). A list of all editors can be found below). 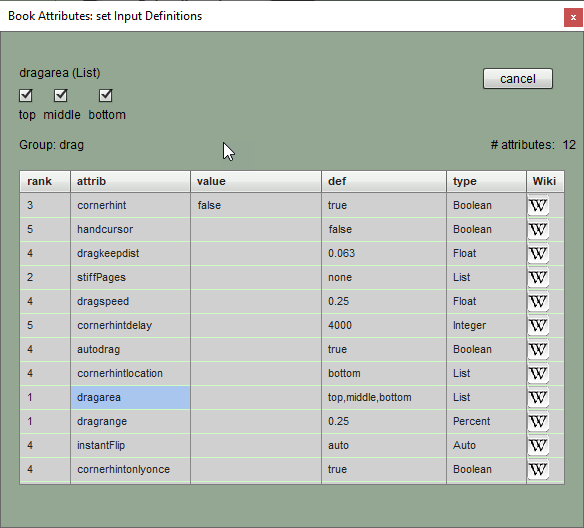 In this example, the “Draga Area” was selected. A drag area is an area in the book that responds to a click (or drag) with the mouse. You can enable or disable these “drag areas”: https: //megazine3.de/doc/Book#dragrange (side book border, upper / lower border) separately. *Example of use Drag-Range: If a link on the page juts into a drag area, you can prevent the page from being scrolled instead of following the link. If the value has been changed and entered with “Enter”, these two buttons are available. “Abort” closes the window and undoes changes. “Save” will apply the changes and save them in the book parameter configuration file. An integer value can be entered in the input field or adjusted with the slider. The minimum and maximum allowable range are displayed on the slider. A change is only possible within these limits. An entered number is also checked for these limits. A float/comma value can be entered in the input field or adjusted with the slider. A percentage value can be entered in the input field or set using the slider. A number can be entered as a value (e.g., area in pixels) OR as a percentage nn%, and is also checked for compliance with individual limits. A fixed value is converted by mz3Tool using the reference value to the corresponding percentage value. Example: The drag range (width of the active area within which you can click or drag the page) is expected as a percentage of the page width. If the page width is 800px and a pixel value of 200 is entered for the drag range, then the fractional 200 & 800=0.25 is calculated. The color can be selected in a color picker or entered as a hex value. The slider can be used to select an alpha value (opacity, also often called transparency). The valid range is between 0 (no coverage, full transparency) and 255 (full coverage/opacity, no transparency). This is illustrated by two example fields with a black and white background. These Boolean parameters only know the states “on” and “off” and are usually used as switches. The status can be selected via the respective radio button (true/false). Clicking on the “Default” button sets the switch to the initial position (depending on the parameter, this can also be “true”!). A check/plausibility check does not take place. These are special binary values that have been extended by the “auto” setting. Since only one setting can be selected, the input is realized as a “radio button”. With a click on such a button, the previous setting is deselected and the new one is adopted. % (color-blue) question out of curiosity%: Does anyone still know who is younger than 40 years old, these old radios with the buttons to select from the FM, MW, KW, LW? From this “key logic” the term “radio button” (radio button/key) was adopted! In contrast to “Default”, the defined default value is not set to the same value in all situations but can change depending on the boundary conditions. Example: Different “normal” behavior on a desktop computer and a touch device. The settings “no” and “yes” can override this behavior and enforce the setting regardless of the environment (calculator, aspect ratio, screen resolution, …). In almost all cases “auto” is a sensible choice. If the parameter can assume several states, these values are stored internally as text with a comma as a separator. You can select the values to be used by checking the box. Unlike a radio button, several checkboxes can be set at the same time. If values of a list with a limited number of settings are available, these can be offered in the form of “checkboxes”.